lokki/math/remapaxis remaps the selfless mode of an axis-49 controller to the wicky hayden layout. lokki/math/accumulatorsimple accumulates signal when inlet is positive, resets when zero or negative. lokki/math/muls 16bit saturated mulitply by 16bit, for those times when you want to squarify the hell ouf of a signal. lokki/math/bitselector [image] filter-like effect, turn off individual bits of the output, either via the object controls or via control input. the control input is andor'd (^) with the selected bits in the object. lokki/math/quantizelive [image] bit-depth control via cc. from 1 to 28 bits. lokki/mix/mix 4-8 gsc [image] like the original mix objects but for all those cases, when you distribute volume equally among sources. since i do this a lot this saves quite some time and should also be less ram hungry other "sizes" or k-rate on request. 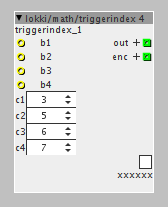 lokki/ctrl/btn 4 i [image] allows you to trigger 4 events and outputs an index accordingly. index can be latched or momentary. lokki/sampleredux.axo samplerate reduction by skipping n samples of the input. with a mask input to create more slurrish sweeps of the samplerate. lokki/patches/ratereducer [image] some fun with sample and hold, geared towards bass-notes...nasty sounding. lokki/octaver.axp "analog" octaver based on oc2 schematic/function. this uses the same mechanisms that the oc2 uses to generate an octave down signal from any audio input. it reacts to dynamics and the waveform of the octaves signal is reminicent of the input. the waveform stitching is slightly different then the one on the oc2, mine is based on valve wizards u-boat circuit. lokki/sampleratereducer.axp naive approach at samplerate reduction, only process every n-th sample of the input. lofi ahead and a different take at samplerate reduction with Axoloti. here is a short demo of the auduloti oscillator (2 of them). later on the destroyer module comes into play as well (you'll notice the volume change, hehe) all modulation is done via aftertouch. played on my midi ribbon bass. cheap drum sequence is a loop from the daw. no editing or efx on the axoloti output. remaps the selfless mode of an axis-49 controller to the wicky hayden layout. bass-synth using formant-filter for vowel sounds. based on cwitz formant-synth but extended with more vowels, and f3 to get more clarity. also frequencies are a little different set, since i found other references select two vowels and morph between them via aftertouch. also has a non formanted bass out (square through vcf). output the channel of the last played note or the last "anything" received via midi. remaps integers to other integers. if input value is out ouf range, last value in range will be remapped. accumulates signal when inlet is positive, resets when zero or negative. saturated mulitply by 16bit, for those times when you want to squarify the hell ouf of a signal. filter-like effect, turn off individual bits of the output, either via the object controls or via control input. the control input is andor'd (^) with the selected bits in the object. some fun with sample and hold, geared towards bass-notes...nasty sounding. bit-depth control via cc. from 1 to 28 bits. like the original mix objects but for all those cases, when you distribute volume equally among sources. since i do this a lot this saves quite some time and should also be less ram hungry other "sizes" or k-rate on request. allows you to trigger 4 events and outputs an index accordingly. index can be latched or momentary. Hey thx looks great but I need it for external footswitches, so i need b input. Also versions with 8 and 16 could be great for building step sequencers for example. i'm on it. reread your initial post and thought that you needed that. will do 8 and 16 versions as well! takes trigger inputs and outputs an index accordingly, index can be latching or momentary. only one switch at a time.